Neal Bogosian, a professional writer from Rhode Island, has published a new baseball book: The Adventures of Chip Doolin. It is a story about an innocent farm boy with Ruthian talent, who becomes the first baseman of the 1909 Detroit Tigers. It is an entertaining and well-researched book which I would highly recommend to anyone with a youngster who is learning about baseball. 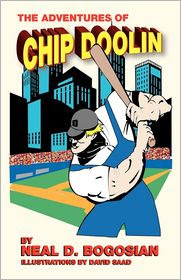 Chip is a completely fictional character, but the rest of the players in the book are real. Mr.Bogosian weaves many players of the time period into his tales. This includes stars such as Ty Cobb, Sam Crawford and Walter Johnson, as well as lesser known players such as Matty McIntyre and Germany Schaefer. Those that know anything about Tigers history will notice that it is historically accurate and will not experience the annoyance of seeing players playing on the wrong team, year or position. As such, the book serves as a good introduction to early Tigers history, as well as being humorous and nostalgic. The book seems mostly geared towards pre-teens, but can be enjoyed by fans of other ages as well. I'm about half way done with the book and am still looking forward to reading about the rest of Chip's on-field and off-field adventures. You can learn more about The Adventures of Chip Doolin at Amazon.